The 2017 Volvo Car Open in Charleston finished on Sunday with an all-teen final and a first time WTA champ in Daria Kasatkina. This post brings together the highlights from the tournament including a recap of the final and links to memorable matches, points, media and plenty more. 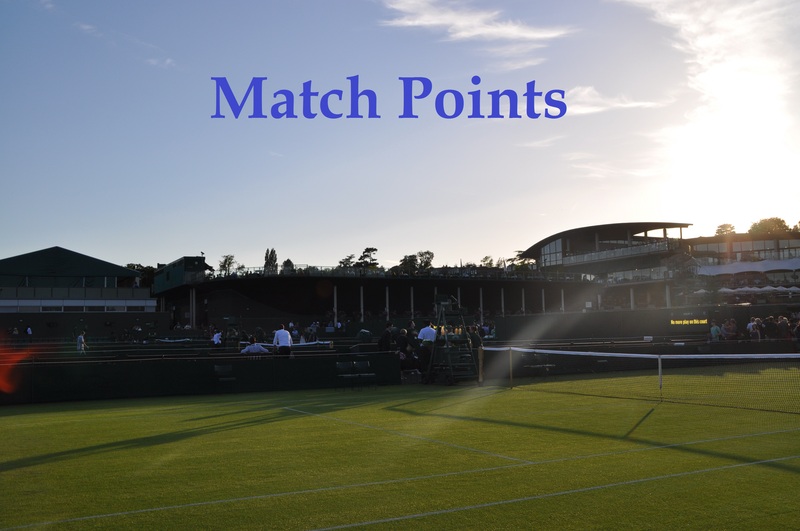 All previous Match Points starting from 2016 can be found at the link HERE. This is my favourite Match Points of the year so enjoy the best bits from Charleston! Daria Kasatkina defeated Jelena Ostapenko, 6-3 6-1 to secure her first win over the Latvian player and a first title on the WTA tour in Charleston. Early days, the final was shaping up to be a great contest. I really like this match-up and i’m certain we’ll see it many more times in the future. Ostapenko was hitting some big winners early on but went away fast from the middle of the first set. Ostapenko’s serve had been one of her greatest weapons all week but it didn’t deliver in this final as she won just 52% of points behind the first serve and 32% on the second serve. This was a super smart display from Kasatkina, especially considering this was her first WTA final. She mixed up the pace of her shots and hit with height and slice, disrupting Ostapenko’s rhythm. The Russian player didn’t have to do a great deal in the second set with Ostapenko offering little resistance at the end with an avalanche of unforced errors. Daria all fired up and such. Sunday’s all-teen final was a first on the tour in over seven years! There were quite a few three hour plus matches this week from Charleston. My favourite was Laura Siegemund’s 6-4 6-7(3) 7-5 victory over Venus Williams, lasting three hours and two minutes. Siegemund played her best match of the year, constantly drawing Venus into the net with dazzling drop shots. Venus battled tremendously as always and chalked up two match points – Siegemund saved them both (see below) and avenged the disappointment of missing one match point in the second set to win deep into a third set. Final Stats: Siegemund d. Venus. It didn’t end on a winner but a fabulous point with Siegemund fending off a second match point against Venus. There were some memorable handshakes this week in Charleston. Dasha squared came up with a planned fake-out handshake… love them! Nice to see between Mirjana Lucic-Baroni and Aleksandra Krunic. And liked this pre-match moment between Lucie and Beth! The Volvo Car Open always do some great features on their YouTube page and this year was no different. Madison Keys explained her approach to dealing with abuse on social media… nothing but respect for Madison. Daria Kasatkina and Sloane Stephens were great together in interviews for Tennis Channel. This one after Daria’s second round win over Monica Puig was my favourite.
.@DKasatkina chats w/ @sloanestephens & @steve_weissman about how she bounced back today, her thoughts on playing a friend, & more! Loved listening to the Body Serve Podcast this week and their Charleston All-Access Hour round-up was a great listen. Congratulations to amitooshacham who won the Draw Challenge for Charleston. To join in the fun, you can enter Tennis Draw Challenge and join the Moo’s Tennis Blog league. That’s a wrap for Charleston! I love this tournament and i’d love to attend one day. Following a hectic five weeks of tennis in the US, i’m now going to take a couple of weeks off from blogging to prepare for the European clay court season. There will likely be one post next week that i’m currently writing but I’ll be back for another of my favourite tournaments in Stuttgart (starting 24th of April) which promises to be fascinating this year… can’t wait! April 9, 2017 in Charleston, Match Points, WTA. Yep it was a shame to see Ostapenko go away so fast in that second set. Not gonna lie, I teared up when she broke during her speech. And Pavs wins her FOURTH Monterrey title! Yep really touching moment, thrilled for Dasha! And pleased to see Pavs win, first time she has advanced past the QFs of a tournament in a long time. On the whole been a good year for her and she’s decent on the clay. Really thrilled for Dasha, too. Such a nice girl! As regards to Pavs: Sorry but I’m really angry about her (..not the first time btw). Why can’t she play like this in every or at least in every second tournament? She was crazily good in the final set. Not much Angie could do abut it. I guess, Serena would have lost the first 4 games of the third, too. If she is not willing to make some more adjustments (being fitter and healthier – she is quite chubby, one has to admit that as well as working on her mental side of the game), she will stay an underachiever forever. That makes me utterly sad. Of course, her year has been quite stable. But does “quite stable” should be the goal with HER talent? I’ve always liked her game, but she literally annoys me. I’ve read a lot of articles, especially one interview from her last – german – coach in a german newspaper. He said she needs to understand that being fit and giving everything even when only training are the basics for professional sport. Pav’s isn’t chubby. She has a naturally boxy figure, much like Kuznetsova and Azarenka. If she were to slim down more than she is now, she’d lose most of her power from the ground and not be able to strike as beautifully as she does now. Her fitness HAS improved this year- hence her making the QFs at the two biggest events thus far this year and backing up with a title win. oh Adrew…come on. I’m not saying she isn’t playing well etc. I just think she could be Top 5 if she’d change stuff. Agree, she has a boxy figure but Kuznetsova e.g. is SO FIT..she can go on forever, Pavs could not. I don’t think she would lose power. There definitely is room for improvement and losing some fat and converting it into muscles would definitely help her to not be that fatigued as she was in set 3 yesterday. She came from the toilet break, clearly exhausted, and decided to go for all of her shots. It worked out, she played great. What if she’d missed those shots? Angie would have run her down – not because of pure talent but because of pure fitness. This is what annoys me. She still is an underachiever (which is sad). Kuznetsova is an endurance athlete. Pavs isn’t. You can work on fitness, sure, but at the end of the day, if she lacks slow twitch muscle fibre’s then she’ll never get to a Sveta level of endurance. But you have touched on why she doesn’t always perform well- she can only play her very best tennis when she’s properly relaxed. You can’t play big strike tennis with tense muscles. So actually the best way for her would be to work on her flexibility and mental fortitude (perhaps through yoga/meditation). Bouchard playing the $80K ITF tournament in Indian Harbour, Florida. Smart move. Yup, plays a yet-to-be-determined qualifier in the first round. Bouchard just edged ITF qualie Bianna Morgan 6-4,2-6,6-4 in Indian Harbour. Morgan is ranked #601, but destroyed her three opponents in the qualies. Saw a bit of it, lots of breaks in the decider, a win is a win. The stream was good, better than I’ve been using for WTA this year! Kasatkina with the new auto—After watching all those Russian car crash videos on YouTube, there is no way I would drive in Russia especially in the winter!!! Victoria Duval coming back from lymphoma cancer beats Eugenie Bouchard 6-0,6-3 at the ITF Indian Harbour tournament. Teenagers on the move—17 yo Vondrousova and 15 yo Anisimova into the semis in Biel and Indian Harbour. Another Czech star on the rise! Who does everyone like in final? Vondrousova or Kontaveit? Impressive stuff. Winning a title in only her second proper WTA tournament. In straight set no less. Cool Stuff. Winning a title in only her second proper WTA tournament, is a remarkable feet/ Lets see what the future hols for her.